A battle is raging among finance theoreticians, and investors should stay out of it. 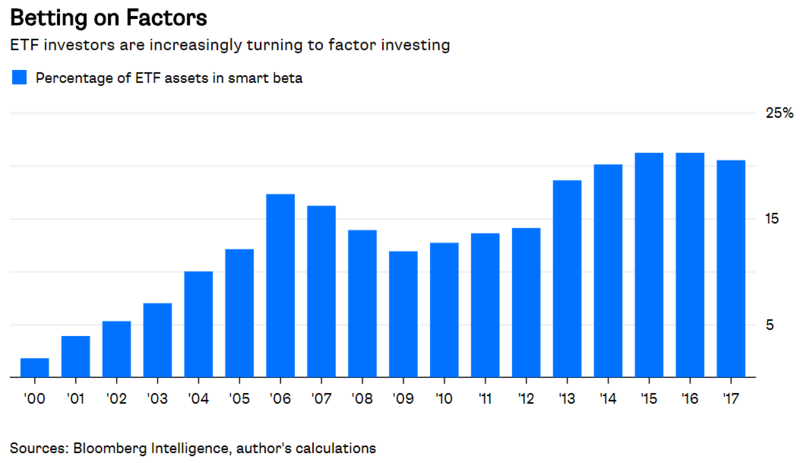 There’s a growing recognition that a handful of active investing styles — also known as factor investing or smart beta — can be expected to beat the market over time. Among them are value (buying cheap stocks), quality (buying profitable and stable companies), momentum (following the trend) and size (buying small companies). The evidence is compelling. The cheapest 10 percent of U.S. stocks — sorted on price-to-book ratio and then weighted by market capitalization — returned 11.9 percent annually from July 1926 through March, including dividends, according to numbers compiled by Dartmouth professor Kenneth French. That’s 1.8 percentage points a year better than the S&P 500 Index during those nine decades and 3.1 percentage points a year better than the most expensive 10 percent of stocks. Value also won over shorter periods. 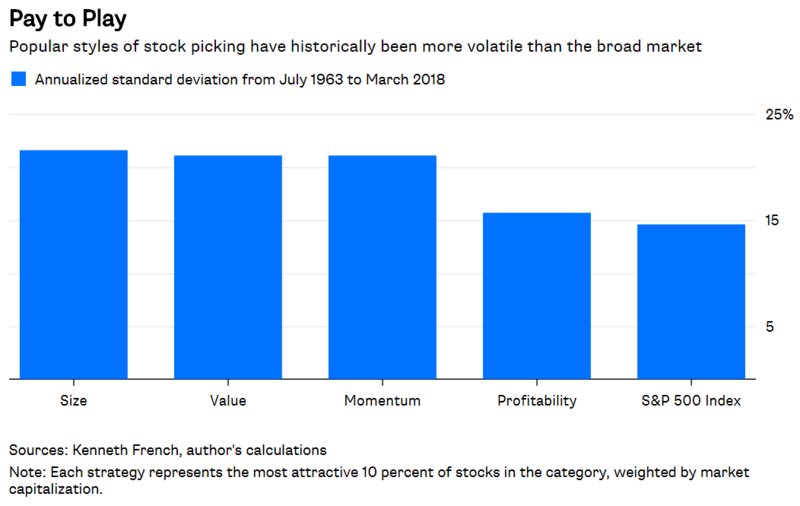 The cheapest 10 percent of stocks beat the S&P 500 roughly 72 percent of the time over rolling 10-year periods, and they beat the most expensive 10 percent of stocks 73 percent of the time. The results are similar for stocks sorted on profitability, momentum and size. It’s not entirely clear, however, why such simple strategies beat the market, and therein lies the debate. 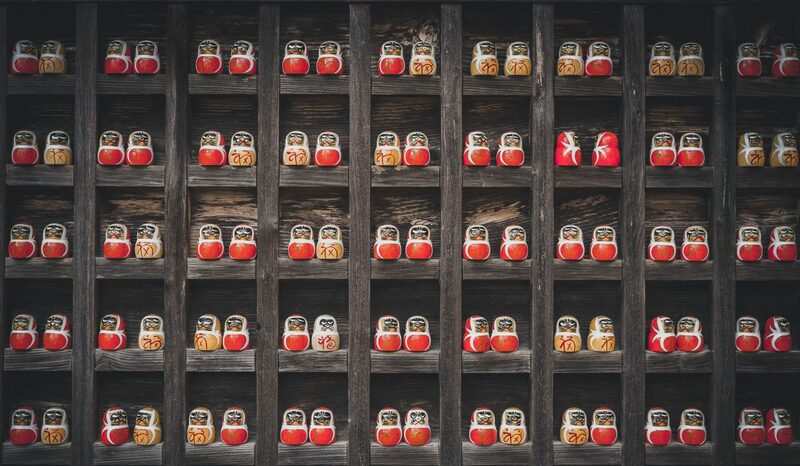 Proponents of risk-based explanations say that those strategies involve more risk than investing in the broad market and that the outperformance is compensation for that additional risk. It makes intuitive sense, for example, that beaten-down value companies are riskier than highflying growth ones. Or that the future of small companies is less certain than that of large ones. Risk-based explanations for quality and momentum may be less obvious but still appealing. Profitable companies tend to attract competition and regulation, both of which are bad for business. And momentum is great at chasing the trend but can crash during sudden turns. It’s not unreasonable to expect a reward for taking on those risks. On the other side are proponents of behavioral explanations who say that mistakes made by some investors create opportunities for others. Investors overreact to bad news. They invest in companies with the sexiest stories, not the highest profits. They chase performance, buying when stocks rise and selling when they decline. And they overlook smaller companies. This debate isn’t new, but it has intensified recently. One reason is that value investing — arguably the best loved of the bunch — has failed investors in recent years. Those cheapest 10 percent of stocks haven’t beaten the S&P 500 or the most expensive 10 percent over any 10-year period since May 2013. 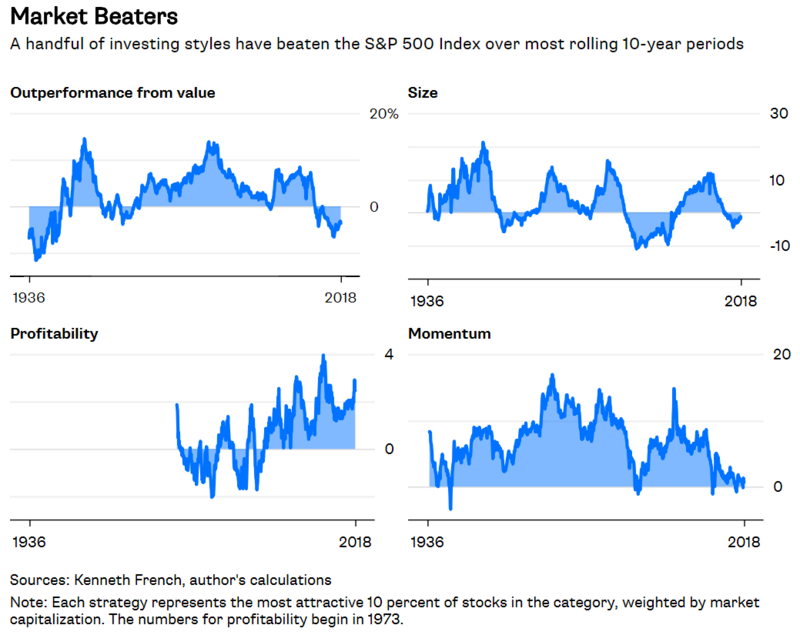 Granted, other styles such as profitability and momentum have outpaced the broad market since then, so investors who diversified their factor bets did fine. But many investors, including some prominent value enthusiasts, are asking whether value has stopped working and whether other styles are vulnerable, too. The debate over factor investing seems to promise some answers. If the behavioral camp is right, then opportunities to profit may disappear when misbehaving investors wise up. On the other hand, if risk-based explanations are correct, then investors willing to accept more risk can continue to expect a reward. Investors hoping for reassurance are likely to be disappointed, however. For one thing, there are good reasons to believe that both behavioral and risk-based forces are at play. There’s lots of evidence that investors are bad at investing. Here’s one: The investor shares of Vanguard’s S&P 500 Index Fund returned 8.9 percent annually over the last 10 years through April, but investors in that fund captured just 5.1 percent, according to Morningstar. There’s also evidence for risk-based explanations. Cheap stocks are more volatile than expensive ones or the broad market, which implies greater risk. The annualized standard deviation of the cheapest 10 percent of stocks was 32 percent from July 1926 through March, compared with 20 percent for the most expensive 10 percent and 19 percent for the S&P 500. Momentum and size also suffered a bumpier ride than the broad market. More important, even if one explanation ultimately proves better than the other, it wouldn’t alter the challenge facing factor investors. Namely, even the best strategies often lag the broad market, and sometimes for long periods. It’s impossible to know in those moments whether the strategy is temporarily out of favor or gone for good. That judgment can only be made decades later with the benefit of hindsight, which means investors will never have the clarity they want when they need it the most. With the growing popularity of factor investing, the banter will most likely intensify. But investors should be careful not to get mired in the debate and keep in mind that there’s no avoiding the uncertainty in straying from the broader market.